﻿ Climate vulnerability assessment of all states, UTs soon. Climate vulnerability assessment of all states, UTs soon. The assessment would be based on the global methodological framework of 2014 Intergovernmental Panel on Climate Change (IPCC), where vulnerability is defined by how ‘sensitive’ a specific eco-system is to climate change risks and what is the current adaptive capacity to mitigate the risks. “The project for the 12 Himalayan states is completed and now it would be extended to all other states and union territories. This would enable us to compare vulnerability profiles of all states and prioritize action on climate change," said Dr Akhilesh Gupta, head, climate change programme, Department of Science and Technology (DST). It would be the first-such climate vulnerability index for all states, as there is no such national rating at present to determine which states are more vulnerable to climate risks based on a common set of indicators — socio-economic, demographic, health, sensitivity of agricultural production, forest-dependent livelihood and access to information. 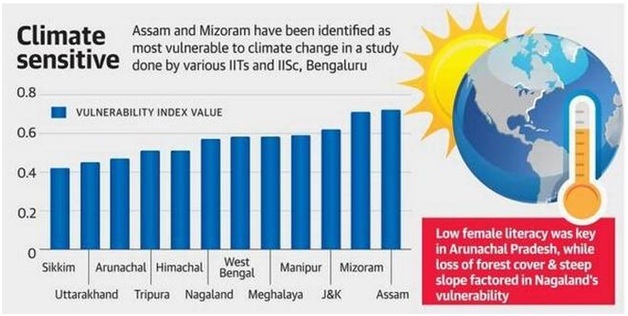 Among the 12 Himalayan states, Assam and Mizoram were found to be the most vulnerable to climate change. Assam, not only has a low per capita income, but also the least area under irrigation, low percentage area covered under crop insurance and a high proportion of marginal farmers, making it extremely vulnerable. “More than 60% of population in Assam rely on climate sensitive agriculture as a primary source of income. There is high yield variability of food grains, which indicates fluctuations in agro-climatic conditions over time. The population living below the poverty line (BPL) is also greater than national average, and there is lack of access of information," stated the report, which was presented at the 24th Conference of Parties (COP) meeting held in Poland last December. The assessment for Himalayan states was conducted by researchers from Indian Institute of Technology (IIT), Guwahati, and IIT Mandi in collaboration with the Indian Institute of Science (IISc), Bangalore. “India is among the most vulnerable to climate change. Such assessment would help government to assess which states or districts need more resource allocation for adaptation and mitigation of climate change, depending on how vulnerable they are," said Professor N H Ravindranath, from IISc Bangalore, adding that it would also nudge governments to revise their first state action plan based on current situation.